By the end of last week, it was beginning to feel like things were starting to come together with Thunny and I. And by that I mean that the spastic chicken had finally developed the ability to let go of its inside rein. 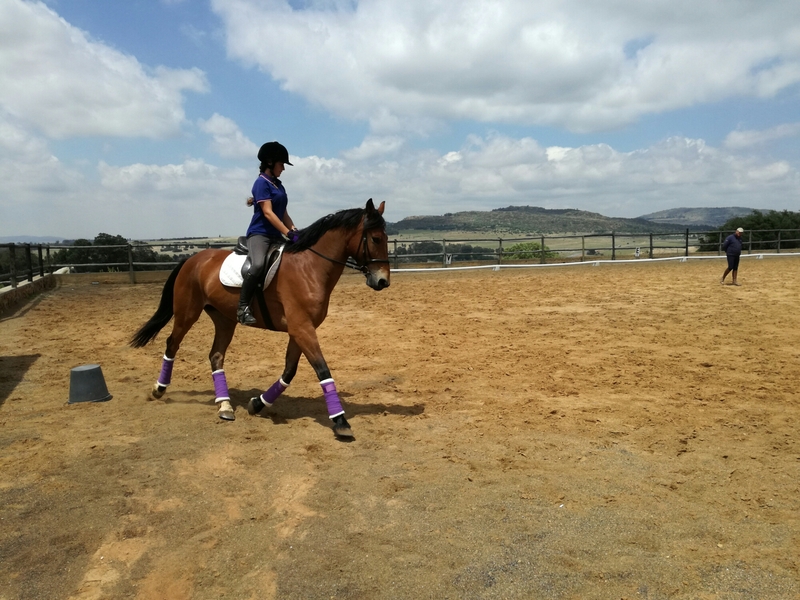 So we headed off to our next lesson with optimism, which was rewarded when Coach J only made us do the turn on the forehand exercise like three times and moved on to other work – still on the same theme. Straightness and connection and bend. 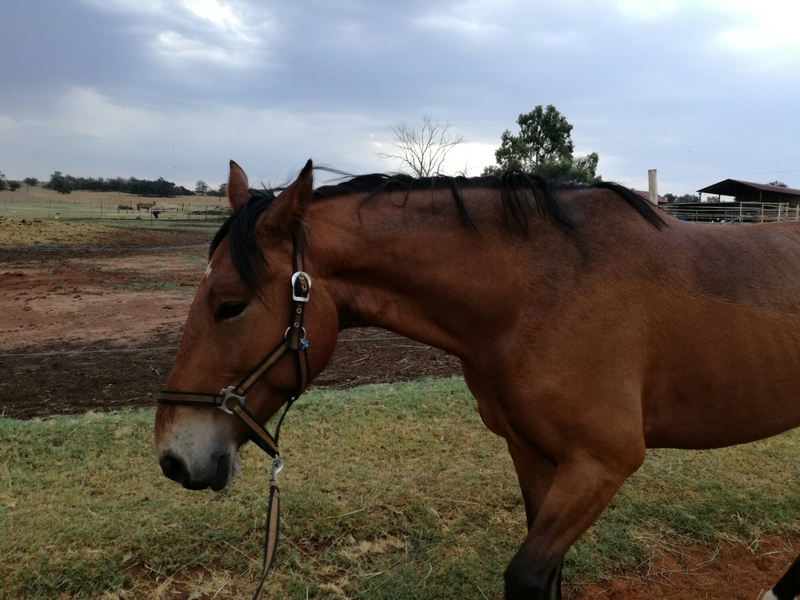 We did alternately long stretches of trotting large, pushing for something like a medium trot (pls Coach J we can barely do lengthenings), focusing on having Thunder really forward off my leg and into my hand. “Use his bum to push his head down, not your hands to pull his head down,” intoned the oracle. To do this I also had to give my inside bend fetish a rest and straighten him considerably, even on the corners, allowing both hind legs to push evenly forward into my hands. I struggled with this because all I really got from him in trot and canter was to run onto his forehand. In walk we got something much nicer, a massive active walk that I could feel over his back. Then we’d move on to long stretches of shoulder-in going large. 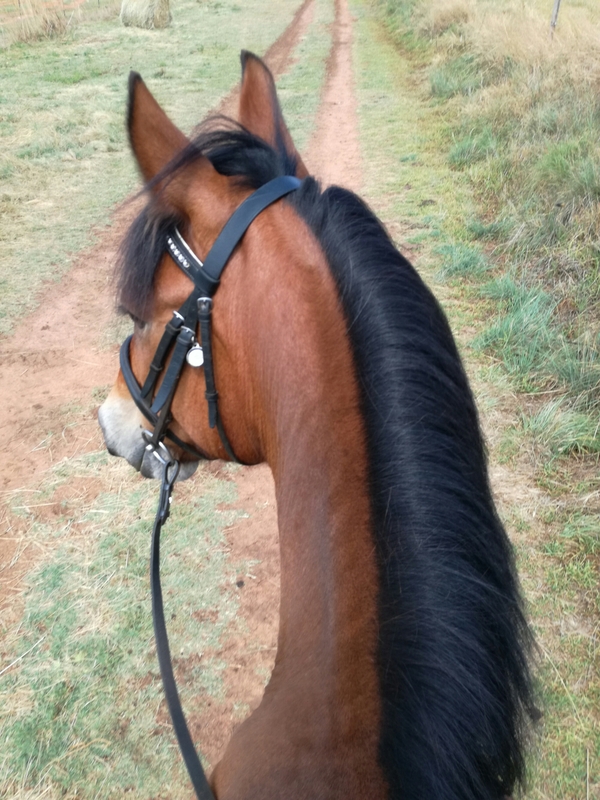 And I had my doubts because shoulder-in hadn’t really been on our radar – shoulder-fore had been a big ask for preparation for walk-canter – but what do you know? I popped on inside leg and outside hand and we had something like shoulder-in. It wasn’t terribly good shoulder-in, though. I generally was too quick to reward Thunny for running out through his shoulder instead of being straight and stepping across, mostly because I have no idea what a proper shoulder-in feels like. More outside rein (always more outside rein) mitigated this, but we both began to degenerate into a bit of a mess about it, so Coach J ordered me off and got on the steed himself. Nobody has ever trained Thunny other than me, so I’ve never really seen him being ridden in a true connection in real life. It took me a few seconds to get over how majestic he is and start to listen to Coach J. Who magically got my horse to shoulder-in. By the end of it he was doing shoulder-in in a long and low frame with a floppy inside rein. I got on again then, but he was quite tired so we just did a couple more and then called it a day. It did feel better, though, and having seen it, I had a better idea of what it’s supposed to be. On Tuesday our session was a bit of a mess. Thunder seemed to have forgotten everything he’d learned about connection and retained only the ability to run onto his forehand. We tried to do some stretchy trot but all he did was run. 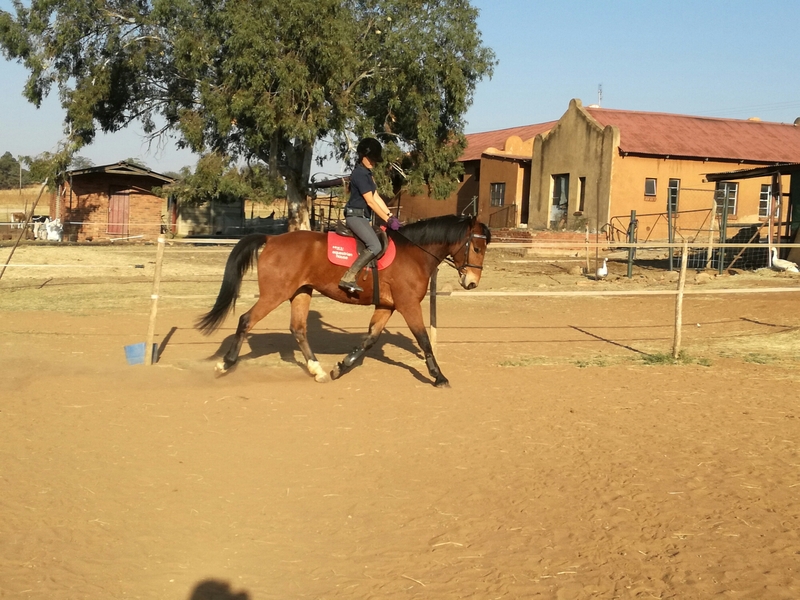 Then I tried to do some lateral work to re-engage his brain, starting with a little leg-yield, and the whole mood changed when I touched him with my inside leg and he gave me the best leg-yield I’ve ever ridden on any horse, ever. After that we did leg-yield all over the place until I was happy as a bird and, thus, he was happy as a bird. Apparently inside leg to outside rein fixes everything. His shoulder-in was better then, too, although he was still quite hollow. Every session since has been better. He does want to run forward in stretchy trot, but the trot itself is better, with much more stretching over his back. We just have to address the break in rhythm. His shoulder-in in walk has been long and low and relaxed, too. In trot I still lose the shoulder now and then, which makes me go tense in my lower back and then makes him hollow. So the connection hasn’t been good at all, but the straightness has improved. The thing I can’t get down at all is that lengthened/medium trot. He either doesn’t lengthen much and falls on his forehand or just runs forward. I have never been able to ride a good lengthening unless the horse had a naturally big and flashy trot (I’m looking at you, Nell), so that’s a me thing, I think. It’s so reassuring to know that I don’t have to have a meltdown over something I can’t get right, because now by God’s provision, we have Coach J to help us. The last leg of the CHG Series was two days before Thunder’s seventh birthday. I had to leave Arwen at home because she was still unfit and not quite sound after a bit of a dodgy trim, so it was Thunny and Rene for it. (Who came second in their Prelim 4 with K, a hard-earned place. I’m so proud of them). I decided to ask Thunder to be a bit grown up today and didn’t have K bring Rene over so that he could have a friend while he was warming up. And he responded by being the quietest and calmest he’s been in the warmup. He had a look around when we walked around the first time and then that was it. Straight to work. I also have inordinate amounts of media for once, so prepare to be bombarded. Here he looks like seventeen hands until you realise I’m a hobbit. My soul does dressage but let’s be real, my seat still thinks it’s eventing. Sigh. Maybe, just maybe the horse is tight in his neck because my hands are bracing? Ya think? He had some truly superb moments in the warmup, though. As usual for a show, he was a little stiff and tense though his back and neck. Not usual for a show, he was really, really behind my leg. I wasn’t really concentrating on it because usually at shows I’m all panicking about if any of my whoa and turn buttons still work, so before I knew it, he was BADLY behind my leg and I was nagging madly. Nagging, for the record, does not and never will work on this horse. His tail is so dressage-y. I love it. The judge made a comment about our amazing earmuffs (more on them later!) and then off we went. The trot work was OK, a little behind my leg but OK. The free walk kind of, well, wasn’t. He can free walk for an 8 (and has in the past) but as soon as he’s slightly tense, distracted, or (you guessed it) behind the leg it becomes a bit of a mess. This judge has a thing about free walk so we got 5.5 for it. Ouch. In this photo he looks really offended because when I asked for my A-F corner canter left he sort of speeded up his trot and fell on the forehand. I asked again just after F and he ignored me, and then I decided the movement was a disaster anyway so I took the whip behind my leg and gave him a big hiding. He does not need to learn that I won’t hit him for blatant disobedience in the show ring. To be fair, he was a little distracted, and I could have prepared him better, but when I ask for canter he’d better canter. Of course then he struck off on the wrong leg and wobbled all the way off the track, but we sorted it out and managed to put in a circle. It was too late, though, and landed us a well-deserved 4 for that movement. I felt it coming down around my ears a bit at that point, but I knew that it was one bad moment in what had so far otherwise been a solid test, so we scraped it together and earned a string of 7s for the rest of our trot and canter work, barring a 5 for the stretchy trot (he barely does it at home – definitely not at shows). That was still good enough for 66%, getting us third place. So it was nice to get a ribbon even if we’d had a little disaster in there. As we headed out of the Prelim 3 arena, the rider before us was only just going in for Prelim 4, so I walked him up and down the path doing walk-halt-walk until he was in front of my leg. I can get him really nicely in front of my leg now, but I have to be very, very diligent about keeping my leg OFF until I actually want something. Then the deal is that I give a tiny squeeze and he must respond. He got one tap with the whip and then realised I had stopped nagging, so then we were back on the same page and went in for Prelim 4 feeling quite chirpy. Evidently I was still not terribly focused, however. Nothing was truly horrible at first, but nothing was that brilliant throughout the test, either; 6.0s and 6.5s except for a 7 for our final halt and centreline (that was quite nice). The serpentines had the comment “show more bend”, which was disappointing because I know I can get a really nice serpentine from him, he likes the movement and is good at it. I actually really like this test for him but I think I just wasn’t really there for him at that point. 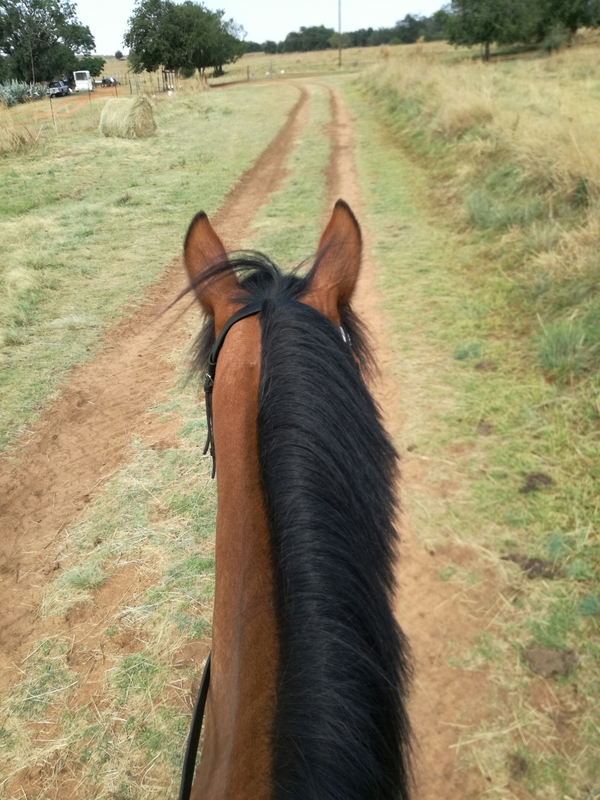 I also forgot the test halfway through the canter work and got the -2 there with comment “broke” even though he didn’t break, I asked him to trot. Poor chap. He also was a tiny bit hesitant going to canter left again, so he got a tap and we managed to get it accurately this time but still lost some marks for the loss of rhythm and balance. Also, almost every movement had the comment “tight neck” and I can really see it in this photo. He’s on the bit, he’s just not connected really, short in the neck, tight in the throat and breaking in the third. He often gets this comment at shows and I’d like to get photos at home again and see if it’s at shows or always. I do feel like he wants to go above the bit at shows and it looks like I respond by jamming my hand down and pulling, which definitely doesn’t help. I feel like getting his neck long is the key to fixing the other comments the judges keep giving us, like nailing us on the collectives for suppleness of the back and asking for more bend. Anyway, we moved on to his lengthening, where I panicked a little and kicked him and he shot off. It was a 6.0 with comment “hurried” and I know he can do better, so I’m actually quite OK with the mark. If I ride it properly I think it could be a 7 already, which is huge for me because I’ve struggled with lengthenings for ever. At the end of the day it was good enough for 63.8% and 4th. And honestly, between God and Thunny, I’m being taken to a completely new place with shows. At the beginning of the year that minor disaster in Prelim 3 would have brought my world crashing down for a few days and opened the door for major self-doubt and anxiety. But it just wasn’t a big deal. I thought, “Well, that was a disaster” and carried on. I have so much more confidence on this horse. I have so much more confidence and enjoyment since I gave it to God. 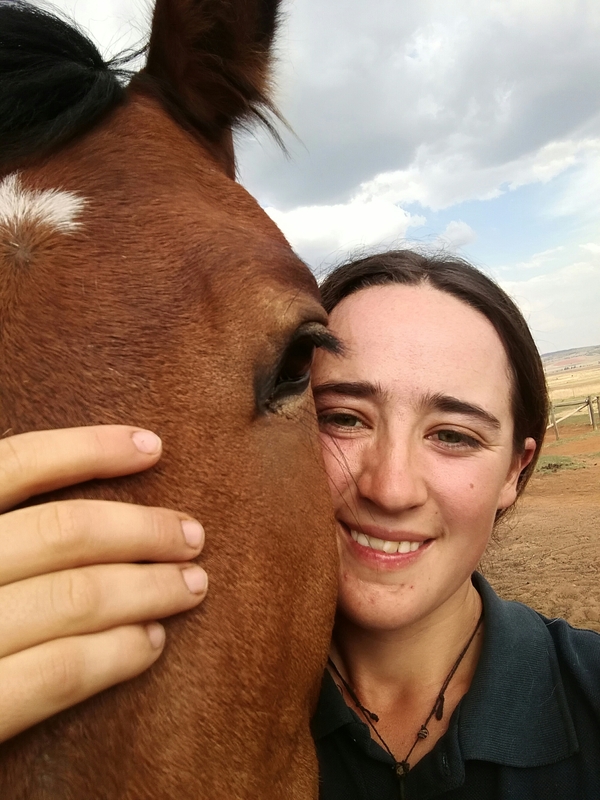 I look forward to shows instead of facing them with fear and dread; I enjoy them instead of enduring them and whatever place I get, I can hug my horse afterwards because he’s so amazing and God is amazing and I love dressage. I take myself so much less seriously, and thus can compete so much more seriously because I breathe in the sport and breathe out the negativity. 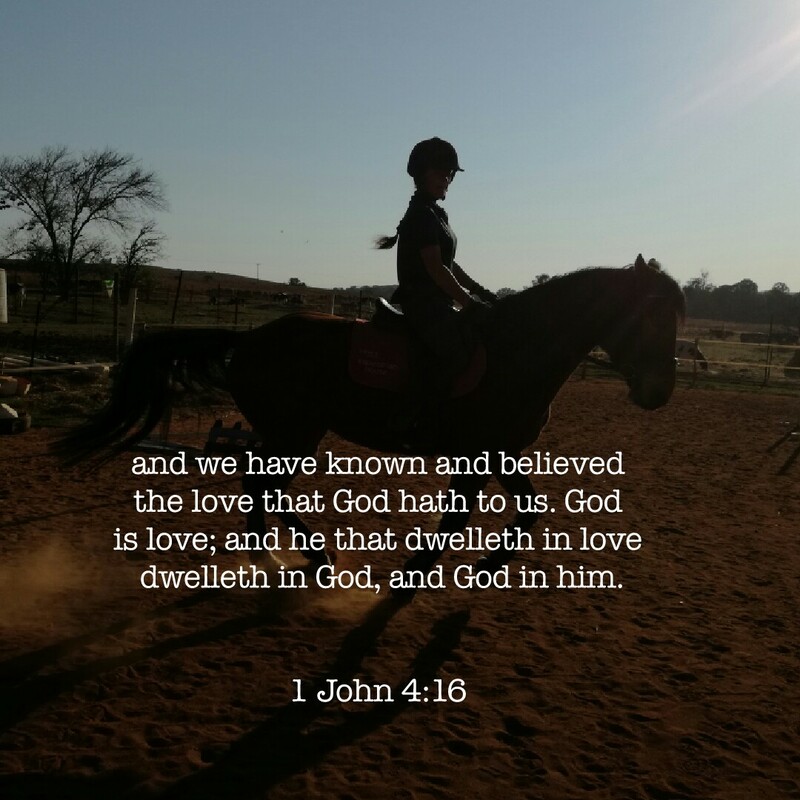 It’s so hard to be anxious, stressed, doubtful, and negative when with every stride I feel this overwhelming gratitude and wonder at the Amazing Grace that saved my soul, let alone put me on the back of a horse with a heart as big as a mountain. God is with us! Glory to the King. 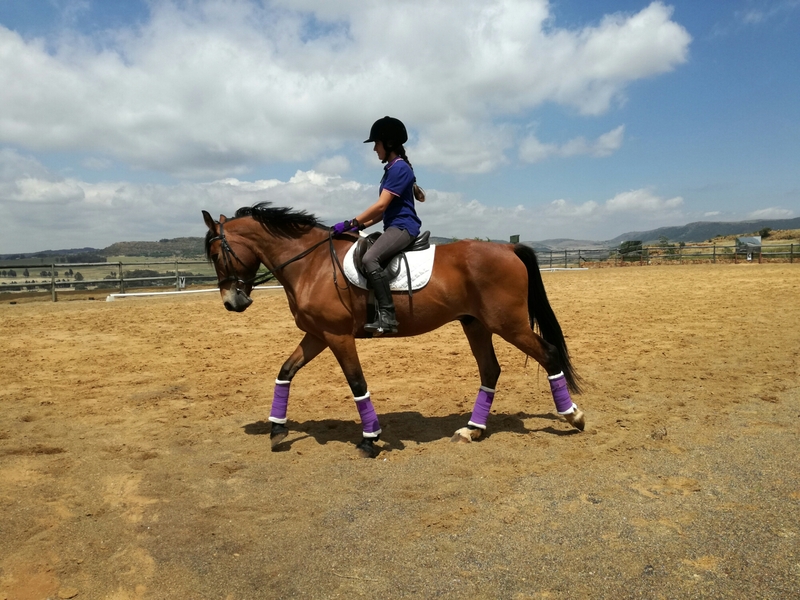 Considering our continued success at Prelim, and the fact that he’s cruising through all of the Prelim work, we’ve started to play tentatively with movements from Novice. But. The idea of moving up stresses me out a lot more on him than it did on Arwen. With Arwen, I never really had a clue what I was even doing (and still don’t really). When we have points for a level, and we can do the movements more or less, we move up. 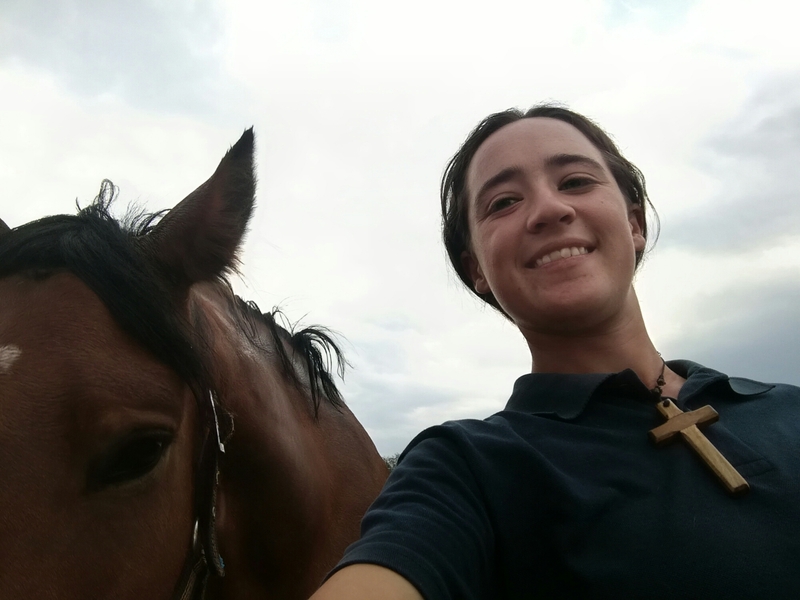 I don’t expect miracles at any level, so I’d rather go and be mediocre at the next level and learn the ins and outs of it for the benefit of the next horse. But Thunder is the next horse. He is scoring better than anything I’ve had before – better than anything I’ve expected – and he has the potential to go so far and I really don’t want to mess this up. Thun won’t care if he never gets out of Prelim – but I do. Not as much as I once did, but this feels like the shot at this sport that I’ve been hoping for. It’s not really the placings, and I know everyone says that, but I truly mean it. Of course it’s fun to place, but I’d rather have a good ride and score a personal best than win with a poorer ride – the rider I want to beat most badly is the rider I was yesterday. No, the draw of the sport is in the dance. I want to feel what Medium feels like. I want to feel what it’s like to dance with a horse like that, something more intricate than circles and leg-yields. And I’m grateful to Arwen for carting my behind up the levels like she has. But she’s bottoming out for one simple reason – her basics just aren’t there. For that reason, I need to know Thunny’s basics are there before I move him up, so that one day we can move up to EM or Medium – God willing, of course. 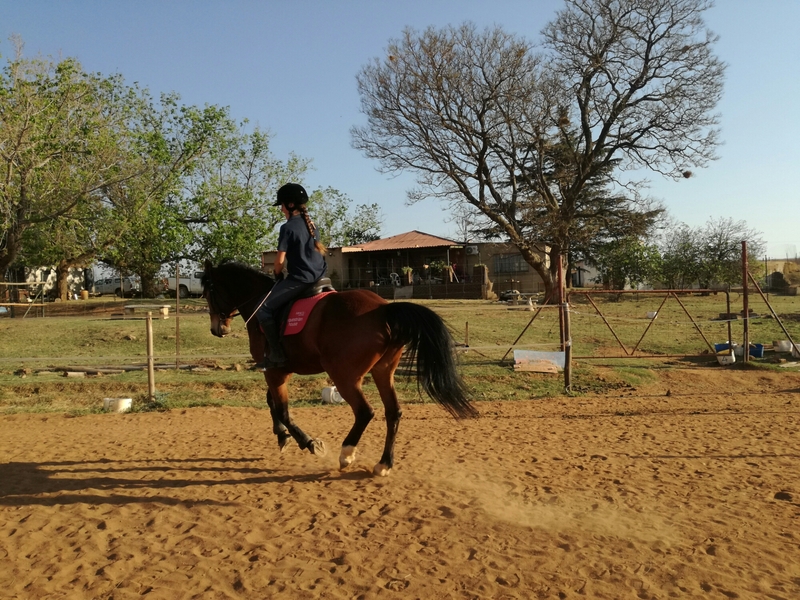 So before I start schooling the Novice stuff seriously, as opposed to just playing and showing him the new ideas, I’m taking a big step back to assess our basics. Thanks to my sister, we have pictures to judge! Spoiler alert: The problems mostly aren’t his. They’re mine. Most of our trot photos were similar to this one. And here’s my take. The bad: I have overcorrected my chair seat sooo badly, losing my lower leg completely and nagging him. He’s the typical lazy horse – too much leg is a recipe for disaster. It’s not helping his balance. My hands are in my lap, which is curling him up, causing his stride to shorten and his back to drop somewhat. The good: Despite my hand, Thunny has managed to engage his back end. He is on the vertical even though the frame isn’t long enough, and his abdominals are engaged. My hands and legs are rogue but my core is engaged for a change and I don’t see any of my old issue with arching my back. The fix: Thun’s frame will definitely look better and loosen his back once I move my hands forward and use a receiving contact instead of bracing. That will also help him go more freely forward. I need to go back to basics and get my heels back underneath me so that I can be more intentional with my leg. Here’s a couple of fairly typical canter shots. The good: Let’s all just take a moment and admire his amazing tail, shall we? That done, I’m actually chuffed to see the canter quality we’ve developed here. He’s moving so well under himself, his frame is present, and he’s showing a clear uphill balance. We even have left bend! Again, my core is looking fairly solid. The bad: … but I’ve overcorrected again, now sitting markedly on my left hip. Ugh. That’s causing him to lean to the inside, and probably not helping at all with our left bend issues. The fix: Sit on BOTH seat bones EQUALLY already, Firn! Our halts are also still a cause for concern, particularly from walk. Trot-halt-trot is better and very obedient, but those halts through walk are a mess. Obedient but a mess. I brace through my wrists and elbows and he sort of ploughs onto his front and throws a random hind leg out, then wiggles because he knows I’m worried about them and then he gets worried. And don’t forget about diving above the bit. So we have some work to do. But mostly, I have some work to do. The horse is pretty much there. trust the horse! He’s got this. Ready for this journey and so grateful for this horse. Glory to the King. After last week spent packing a beginner around at pony camp and the training show, it was time to put Thunder back to work. 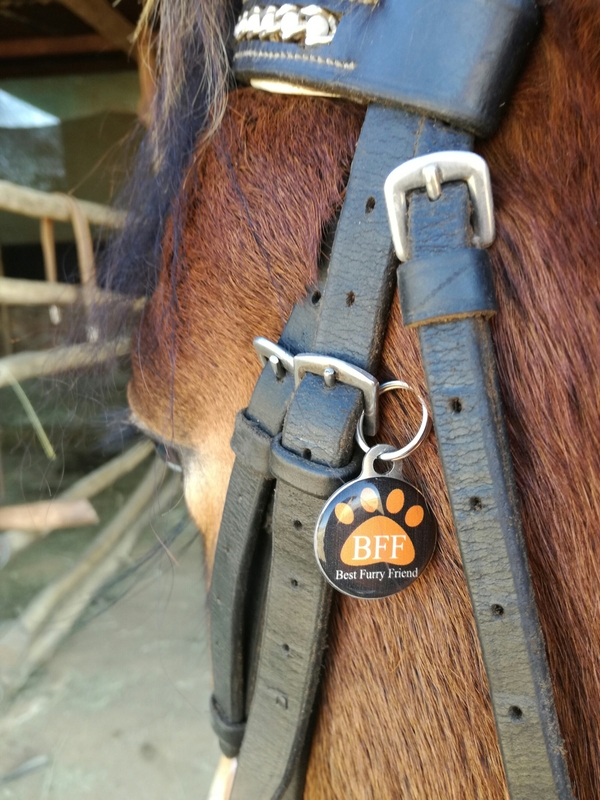 He was so good with his beginner – bombproof really, although he did trot up to each ground pole and then walk and climb carefully over it at the show. I brought him in early on Monday and suddenly was riding a hot, spooky young horse who ran sideways away from a pile of jump fillers. As you do. He settled quickly, though, and we could get to work on two concepts. Going back to what I said after the last show, we needed to work on our halts, stretchy trot, and lengthened trot for Prelim. I am intentionally not drilling the lengthened trot right now. I drilled Arwen’s early on and destroyed it forever. So we do it once a session or so, but I keep it lighthearted, only ask for what I think he can give me, and only when I think he feels like giving it. We also work over trot poles set far apart now and then to help him figure out what he needs to do. 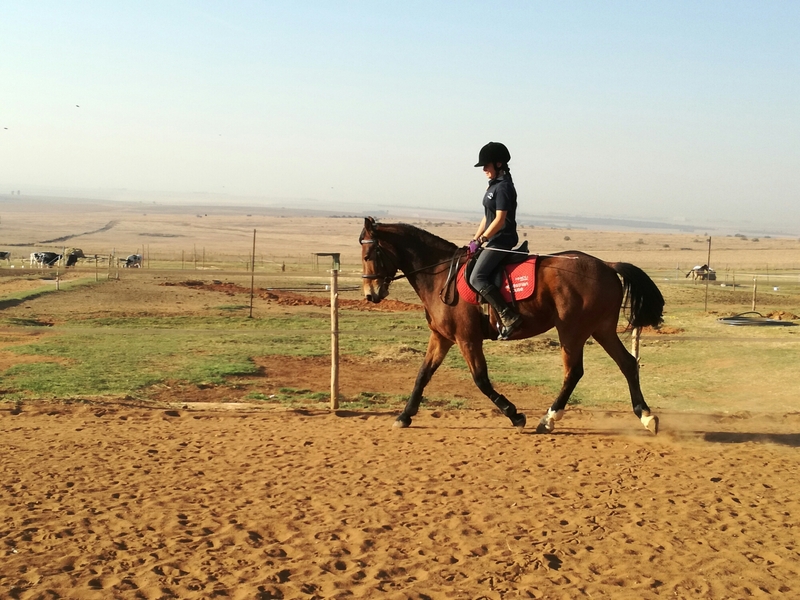 The stretchy trot is also much improved just by incorporating it into the cool-down every session, so that leaves us with the halts and then schooling for Novice next year. We started with the halts. They are a lot better since my light bulb moment of riding the walk actively to get the halt square, but about 50% of the time he’d be square in front and then step forward with his right hind. 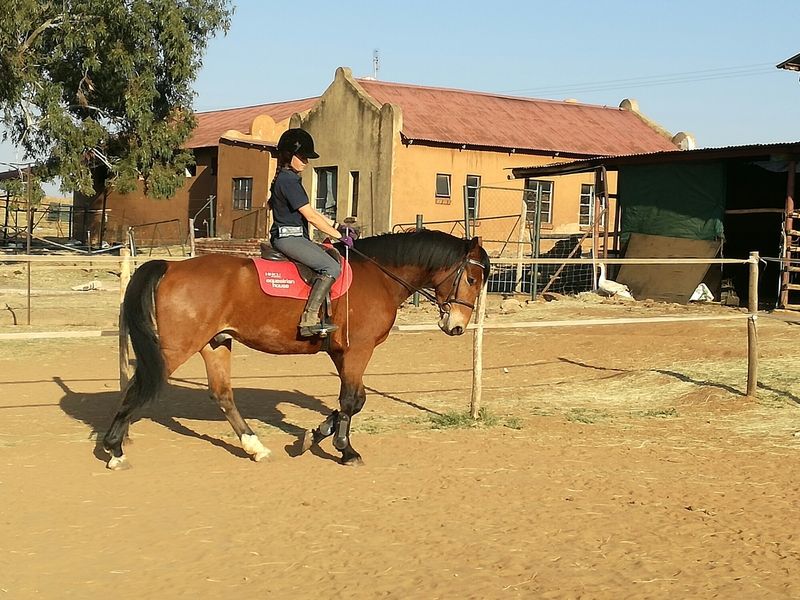 Erin pointed out what should have been blindingly obvious: of course he steps forward with the right hind – I sit so hard on my right seat bone. It’s only because he’s huge and kind and not super sensitive that he only does that instead of swinging quarters to right like Arwen and Nell always used to. So we tried riding the walk actively and sitting harder on my left seat bone (ugh left hip why must you ruin everything?) and we had consistent square halts at last. Sometimes I overdo it and he steps forward with the left hind, but it’s just a matter of me finding my balance. Then it was on to working on some Novice stuff. While we have played with basically everything from Novice, it hasn’t been polished or serious. And the biggest problem remains his canter. 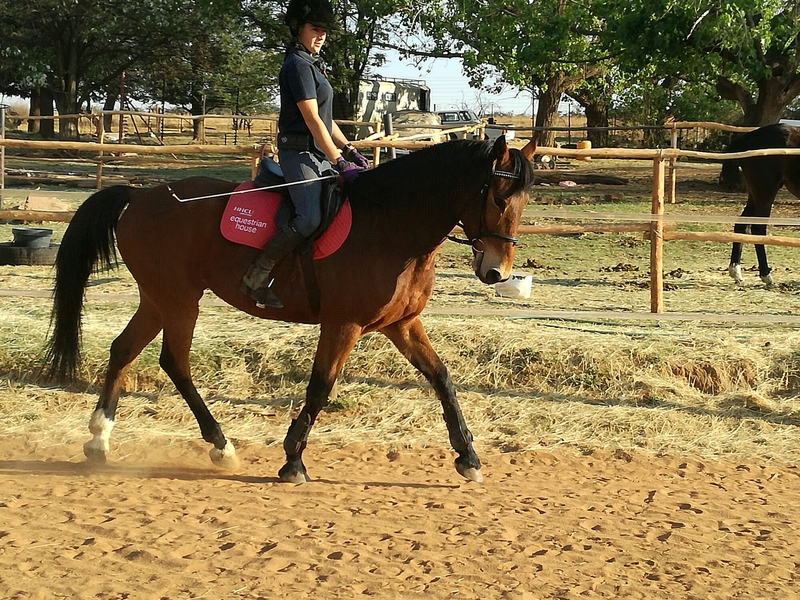 I can hold it together for long enough in a Prelim test to make it look good, and the transitions are some of our best marks, but it’s still not truly in front of my leg. That means it’s not truly connected or supple or balanced either. We started with my favourite, bestest, simplest exercise to get the canter in front of my leg. Focus on sitting really, really still with the leg OFF. The moment he loses impulsion or breaks his rhythm, touch him with the whip behind my leg. Not leg, whip. Leg is Mr. Nice Guy. Leg is for the transition. 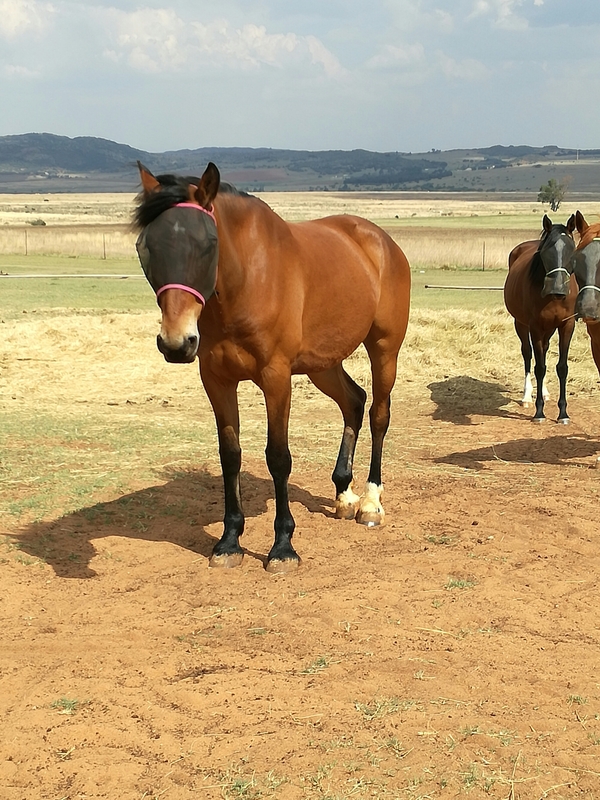 Leg is NOT to keep your lazy behind cantering when it’s actually your own responsibility. If the break in rhythm occurs less frequently, give him a break. If the break fails to occur less frequently, increase the intensity of the whip aid. I had to take the whip aid all the way up to a good smack before the message penetrated and Thun started to do his job, but it did help to reinforce the idea that leg = go and no leg does not equal no go. In other words, he started to carry himself forward. 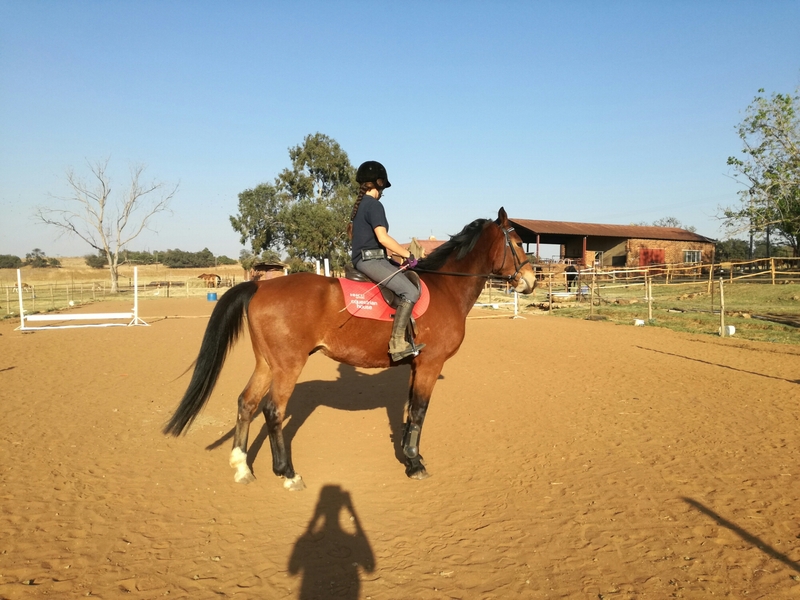 He was quite stiff during this session, so it was evident that he found the idea a bit difficult and it made him a little tense, so I started looking at ways to help him develop the canter muscles to make his job easier. The first was my gymnastic line from last week, the one with all the bounces. If you think about it, bounces are just really high canter poles. He HAD to canter forward and engaged without getting strung out to this exercise – there’s no way to just flop through it. And he did! He didn’t touch a single pole. 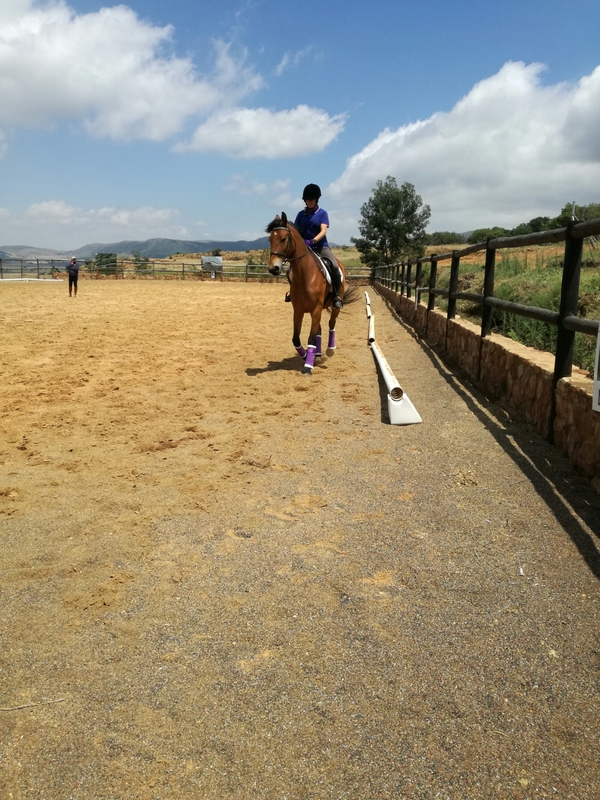 We repeated it a few times, then turned around and jumped it going the wrong way, with the big vertical (80cm) and one stride first and then the bounces. I expected this to be hard because he had to rebalance quickly after jumping the bigger fence, but he just skipped right through. Good chap. Our next session he suddenly had a CANTER! So much so that I started playing with the Novice 3 canter work: loop through X in counter canter, lengthening, 15m circle. He stayed so connected and bent beautifully around the circle. The loop caught him unawares and he did lose his balance for a couple of strides the first time, but it was clean and obedient. We even actually got a lengthening. The transition from lengthened back to working was not as crisp as I’d wanted, but he kept his rhythm. It all wants polishing but it feels as though he is ready to do the polishing. His simple change through trot is also OK but can have too many trot steps, so that’s just something to work on. We ended the week with some raised canter poles. He threw them all over the place at first, but if I rode them light seat he went through well. Getting off the baby’s back a bit can’t be a bad thing over poles, so I was happy with it. 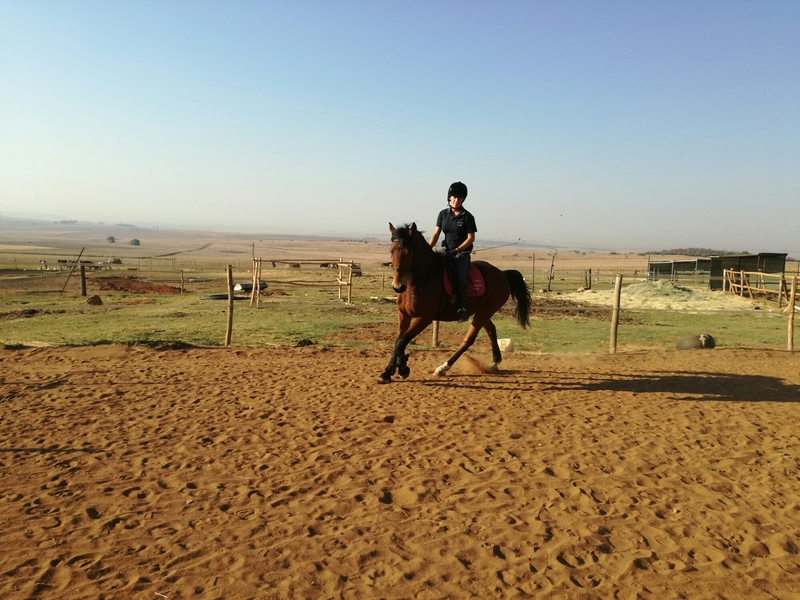 We will add a day of pole work/jumping to each week and I think a day of lunging in side reins in canter especially can also help to strengthen the canter. It’s not bad, really – it just doesn’t feel like his walk and trot, which are both AMAZING. This horse is amazing. A majestic, powerful, adorable marshmallow.